Forget the Golden Arches, I'm headed for the Pearly Gates! No, I'm not going to meet my maker, in fact, because it has been 11 years since last entering the Golden Arches, I expect to be around for a long time. 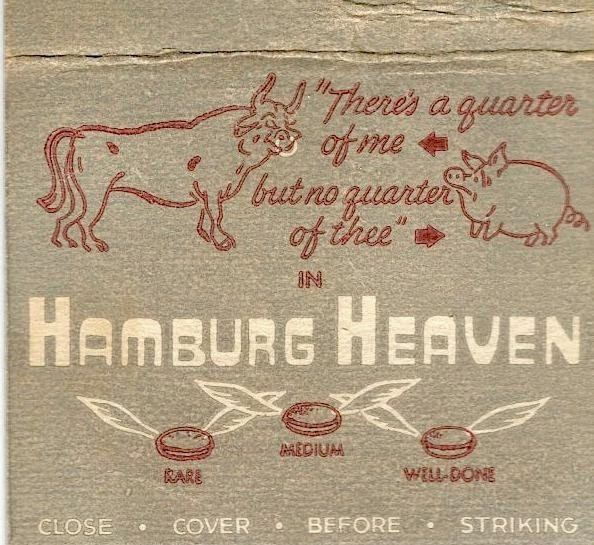 If it is Heaven I am going to, I hope it's Hamburg Heaven. 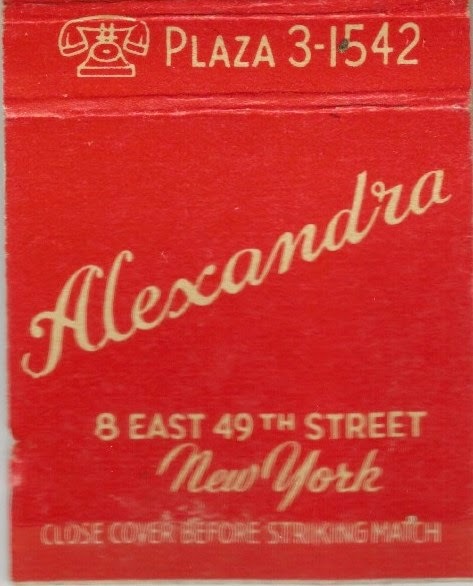 I found about 80 matchbooks at a sale and bought them because of examples like this one. 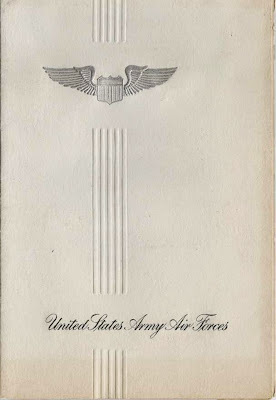 After a little searching on the web, I found a backstory worth telling. No Ham in these burgers! Mrs. Phyllis Sarah Moffett, a Wilton, Connecticut housewife in 1938 decided she would open up a hamburger restaurant. I learned from my sources that she opened up the restaurant after divorcing her husband, noted Neurologist and Psychiatrist Saul Heller. Was it a divorce settlement that funded the new business? We don't know, but I figure that her backyard barbecue skills were her inspiration for the main menu item. The early menu was limited to burgers, salad and "specials." She created a popular eatery in a very busy section of New York that catered to the Jazz clubs and made burgers through the night into the breakfast hour. Through the help of my friend Bob I learned Hamburg Heaven would cater events with their well liked burgers. 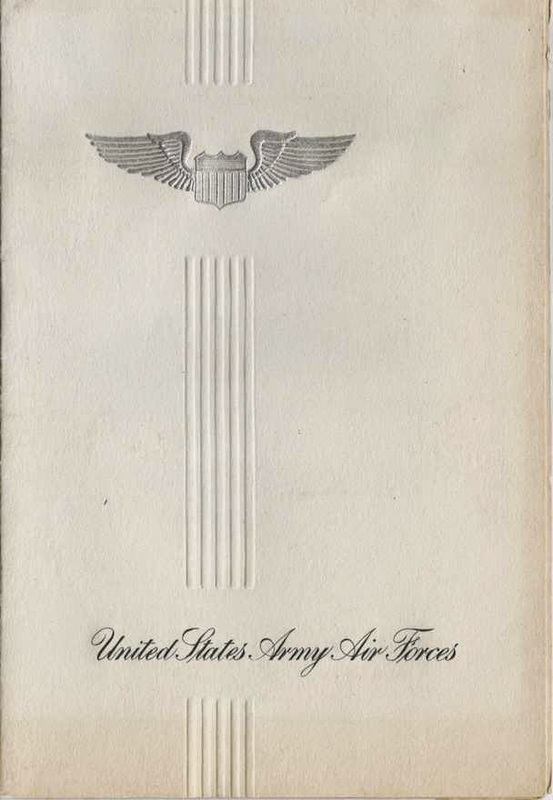 As you can see by the cover above, the business expanded into other locations around the city, even as far as the terminal at LaGuardia Airport. Located across the street from Saint Patrick's cathedral, it is easy to see how the name was chosen and protected. There is a news clipping in the 1950's where a suit was filed against another joint for using "heavenly" in their name. Through its history it was known to have lines around the corner-type success, and stars like Sammy Davis Jr., Henry Fonda and even the Gabor sisters were known to call this one of their favorite places to eat. True? Why would Sammy lie? I know that Mrs. Moffett died in 1964 and the restaurant didn't last long after that. Her son Richard, who went on to a successful career in law and journalism, died in 2006. The business was transferred to another burger joint who left the restaurant layout pretty much the same until 2012 when it closed for good. You can watch a short documentary about the restaurant's successor "Prime Burger" below. Nicely shot but it shows how time absorbed most of the character from this place. 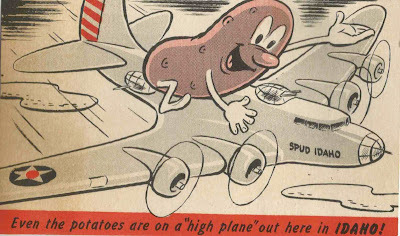 All this content from one little matchbook! ...and I have 70 more to go through. I am surprised that I never started collecting matchbooks. Oh, that's right. I don't smoke. I never smoked beyond some period of teen indiscretion. At its peak the smoking industry put their product and its advertising everywhere. 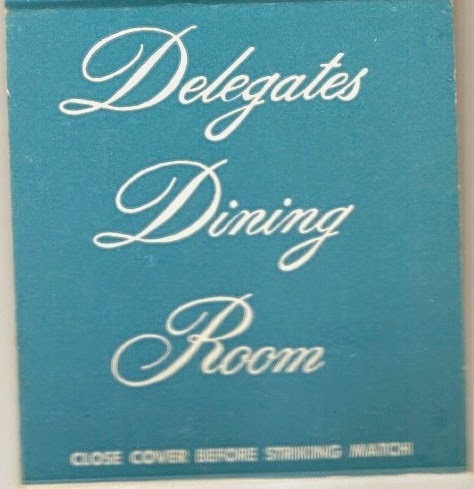 If you owned a restaurant or hotel or any business mid-century you had to have matchbooks printed up for your smoking clientele. 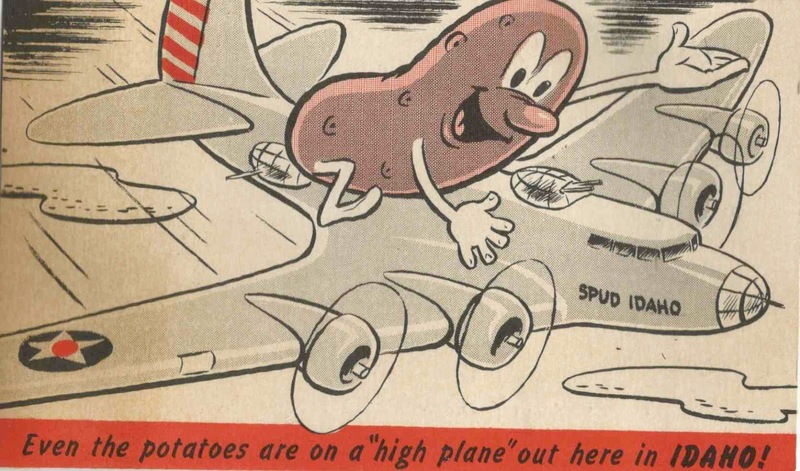 This lead to many graphically fascinating designs and advertisements. These become more collectable as they become scarcer to find. The businesses reflect the times and and the dreams of business owners to have the kind of place people would enjoy and respect. 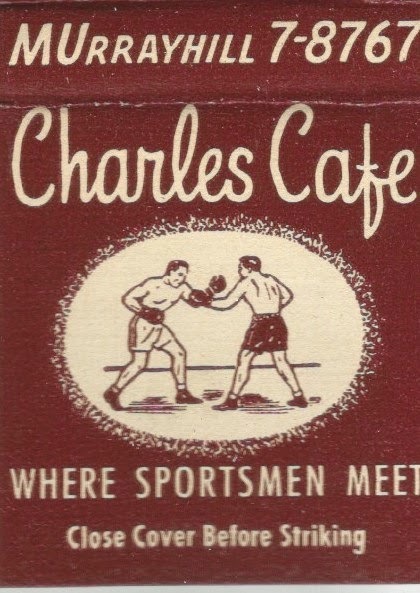 Charles Cafe must have been a unique sports bar that catered to the boxing enthusiast. 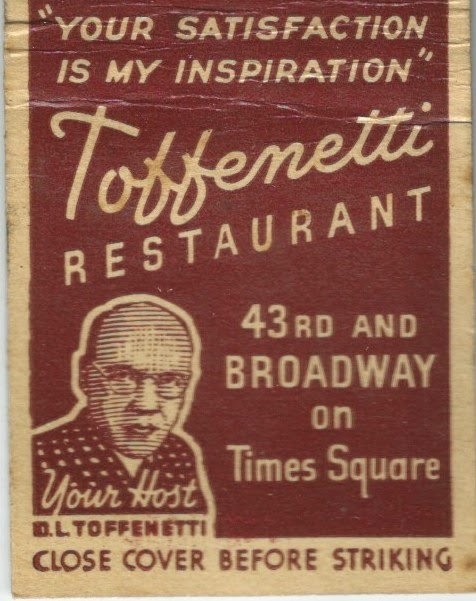 A similar matchbook is going for $45 on eBay. I don't know what a "real" French atmosphere is, but at $2.00 for dinner I'd be willing to give it a shot. Mr. Toffenetti looks like someone I would like to keep happy. Nope, wouldn't be sending anything back to the chef in his place. The quote seems a little backwards, if you get inspired from my satisfaction that's great, but if I'm already satisfied what do I care about your inspiration? He looks like someone just told him that...uh oh! I wonder what it is about "Fried Chicken Maryland?" I do recall there are large chicken processing plants in that area. 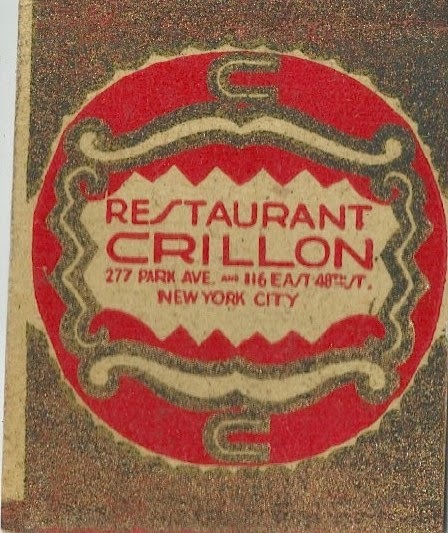 The Crillon has a listing that goes back as far as the 1930's. Does that put this matchbook around this era? If anyone wants to take a crack at the history of NYC restaurants...I'm all ears. One more in this group, diplomatically speaking that is. The range of these is quite wide with the UN matchbook coming in during the 1960's. 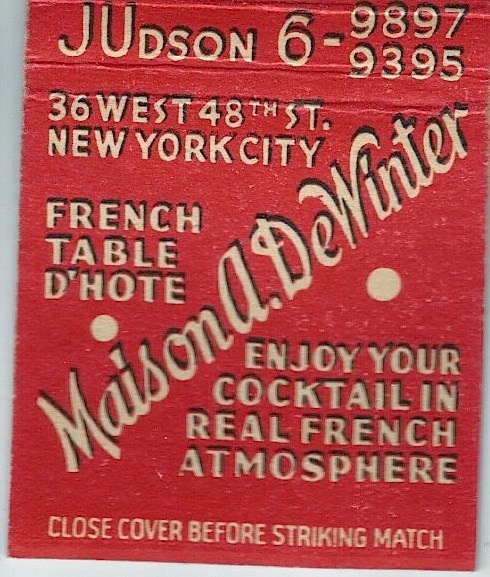 Can you resist a cool matchbook? If I have a super power, I would guess that it is the ability to find the ridiculous amidst the amazing. 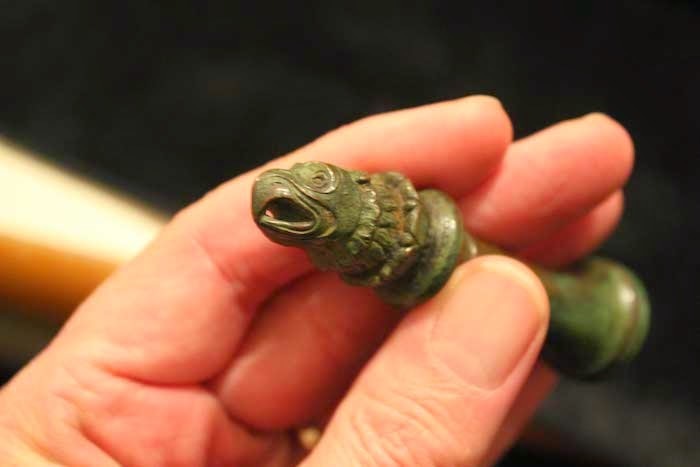 This brass whichamacallit was found at an estate sale in South Kent, CT in September. The sale was a unique old farm house with wide board floors and a fireplace in every room. This oddity was sitting in a box of medical supplies, but I was told that this has no bearing on it's purpose or origin. 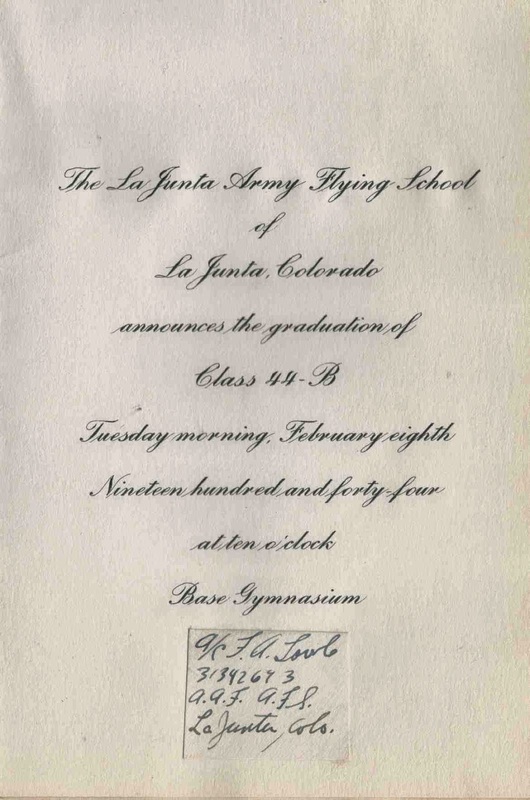 It is approximately four inches high, and fairly substantial. My first guess was a drawer pull. 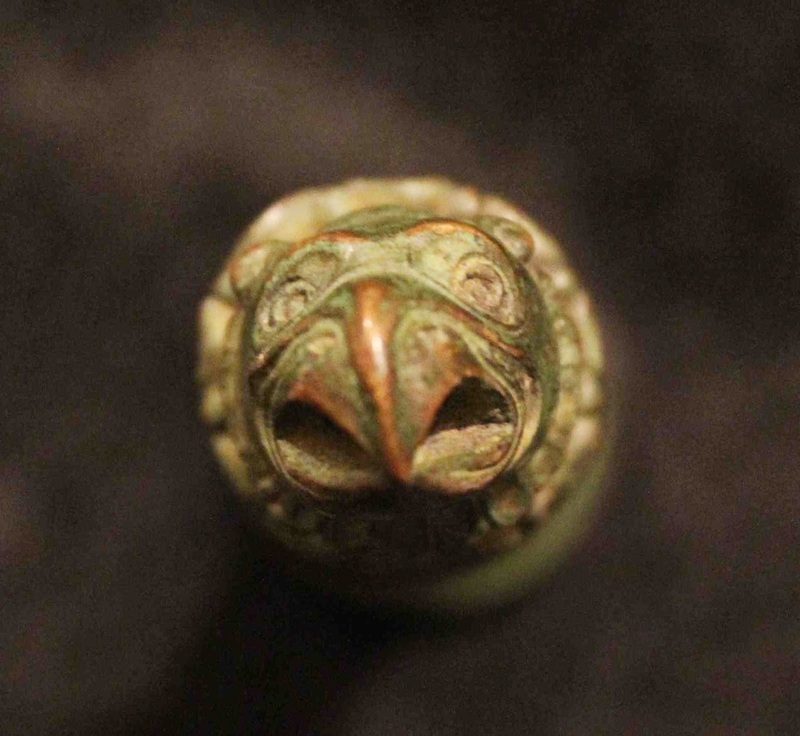 You can see that the beak forms a hole through which a chain or metal ring could be placed. However, the weight of the piece and the size ring it might accept would be an over-match as a drawer pull. The bottom is flat and there are no maker's marks or writing. 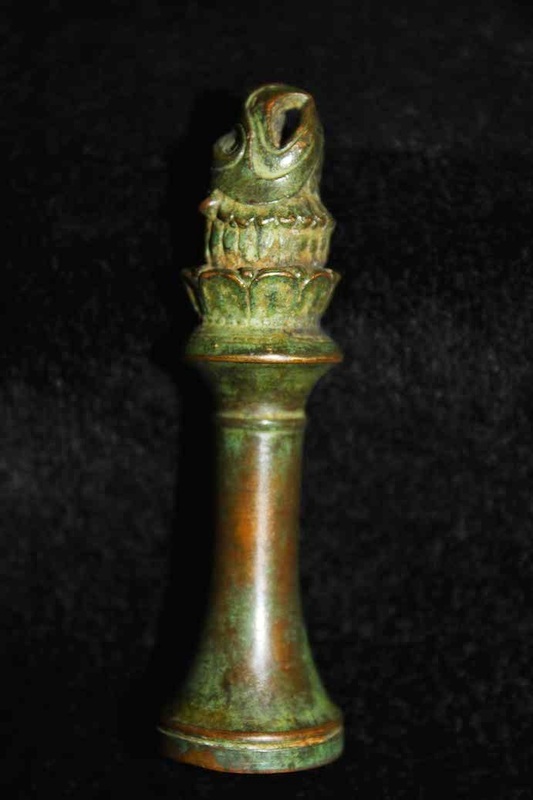 Is it a chess piece? A pill crusher? It looks like the head of a Griffen, I am hoping someone can help me identify it. No Matter How, Where or When...Thank You for Serving. These Items were all part of a much larger collection found this weekend at a local flea market. Over a year ago I began getting requests to share my "Confessions" live by presenting the stories behind some of my best discoveries. I have been enjoying the attention of community groups and libraries and even educational institutions who provide me with an hour or more to share my weekend obsession. At the end of October I was the guest of the Greenwich RMA (Retired Men's Association). This invitation was a pleasant surprise that was revealed by a family friend who pointed out that I was scheduled to speak in-between Charles Grodin and a former director of the Securities and Exchange Commission. I don't think they were ever able to book Charles Grodin, but I was available. Not only were they a very responsive and friendly crowd, they also asked a lot of good questions and recorded the whole presentation. Greg van Antwerp, Urban Archeologist from Greenwich Retired Men's Assoc. on Vimeo. 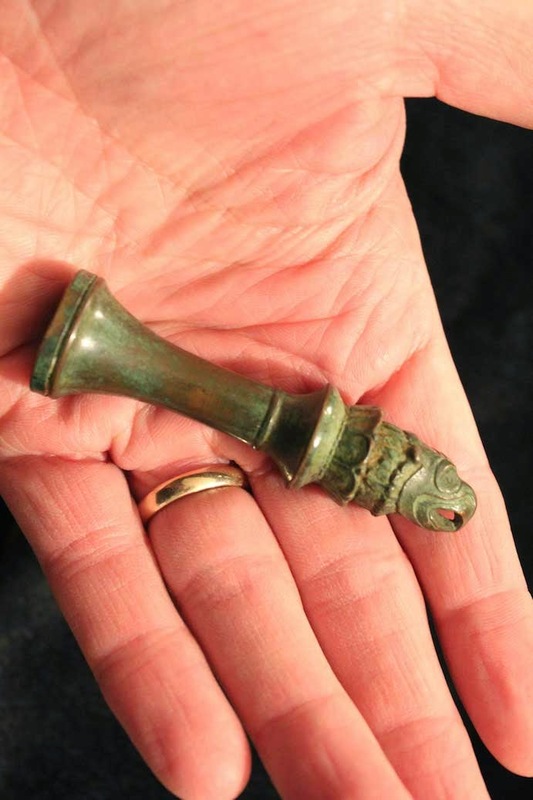 I didn’t intend to become a public speaker when I began blogging about found treasures 5 years ago. It just happened. Saturday, I finished my 10th public presentation on Urban Archeology by speaking at the Edith Wheeler Memorial Library in Monroe. I am by no means a professional speaker, but I thought I could document a few pointers because there could be others starting out like me. 1) Arrive early and practice. If it’s your first time in a new location make sure you know the technology works, from audio visual equipment to the heating and AC. I have had a few stumbles because I relied on computers that were supposed to work but ultimately didn’t. Even after you been introduced, talk to them like they’re a guest in your home. Asking if everyone is comfortable and can hear your voice, shows you are in the moment with them. If they are unruly find some way to burst on the scene. I once tried yelling “Look what I found!” which worked for my topic, but now I use a 40 year-old pop-up projector stand which is loud and eye-catching. It gets their attention if I need it. Even if you are just practicing or maybe preparing an assigned topic, at least pretend it’s the greatest thing in the world. Well, don’t over do it, but passion is something people connect with. If you like your subject matter, so will your audience. My voice sounds shaky when I begin a presentation. When I think it can be noticed I will often stop and say, “If my voice sounds like I’m nervous, it is actually shaky because I am very excited to be here today.” Telling your audience upfront that you know how you sound and feel, wipes away your anxiety. Organizing visuals with a microphone and speakers is sometimes a recipe for something to go wrong. Audio feedback, computers that go to screen saver, and video projectors that suddenly lose signal are common to every speaking situation. The thing to remember is, the time you are taking to fix it seems infinitely longer than what the audience is actually experiencing. So? Roll with it. If moving doesn’t fix the feedback, then kill the mic and raise your voice. Computer hardware can usually be fixed by quickly escaping the program and re-entering. Your audience is always more sympathetic to your situation than annoyed. Leave time for questions. You have given your audience new information, they’ll want clarification in some form and questions help fill in the blanks. Also, it makes you approachable and you gain so much from the quick reviews people give in their questions. You’ll know they got it, or tip you off as to how to adjust for the next talk so they will. That’s not all there is, but as I continue to be invited to new locations I am sure I will glean more from the experience. If you have any tips for successful public speaking please share them in the comments. Your Papers Please! Now Go Vote! I'm not going to guilt anyone into voting, though instead of all the attack ads I wonder if a campaign manager ever thought, "Instead of inciting people to vote, how about we make them feel bad if they don't?" Let me try. 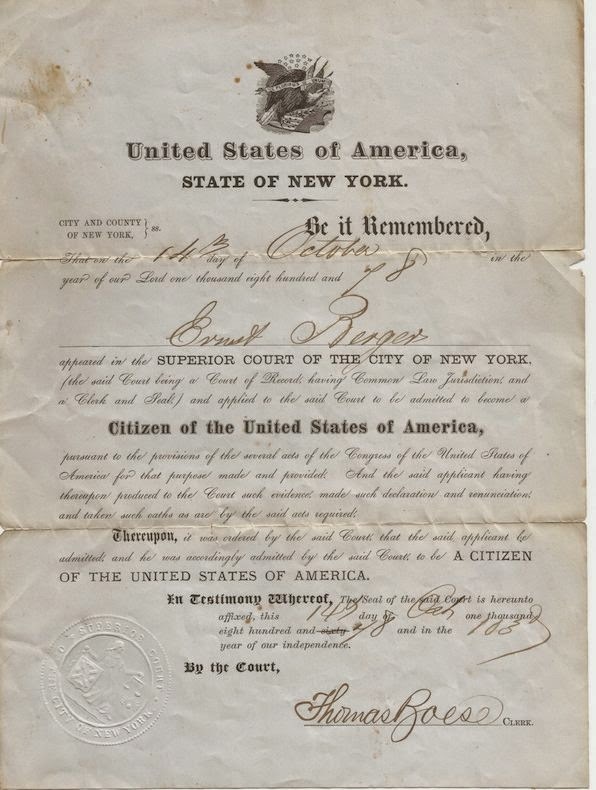 Imagine you are living in a country with poor conditions, oppression, and zero democracy, though sometimes you may think I am talking about the U.S., take yourself back 125 years (imagine). After scraping up enough money, you decide to travel to a place that will accept anyone: America. Poked and prodded and probably oppressed yet again to some degree, you are given the greatest gift in your life - permission to start over in a new place and a government document that says you can do that. Wow! Without over-dramatisizing the moment I would like to believe I can guess what the recipient was thinking when he was finally handed this piece of paper.